Major Hurricane Matthew is still churning through the Caribbean Sea, turning north and setting sights on Jamaica, Haiti, Cuba, and the Bahamas. Is the US next? 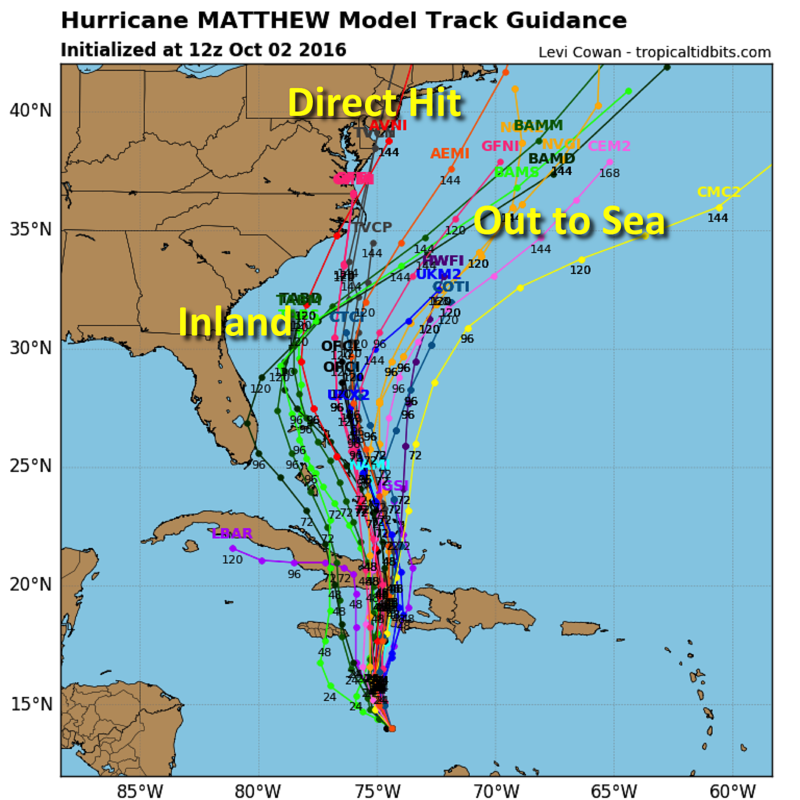 When last I blogged about Hurricane Matthew's highly uncertain track on Thursday and Friday, the future of the storm was highly uncertain. Since then, Matthew has become a powerful "major" hurricane and has made the well-forecast "right turn" toward the north. Jamaica, Haiti, Cuba, and the Bahamas are going to get slammed over the next few days. --Its track through the Caribbean Sea is way further south than the vast majority of Atlantic basin tropical systems, and actually affected the northern coast of South America (Aruba, Curacao, Venezuela, and Colombia) this weekend. 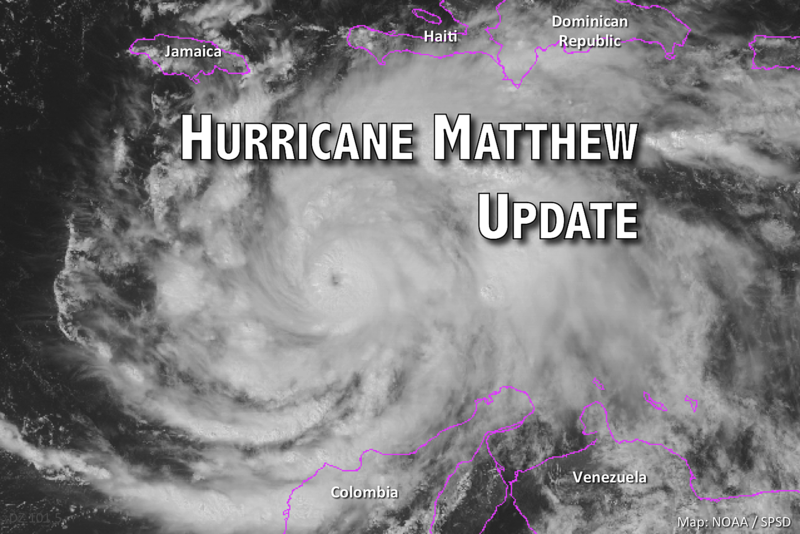 --Matthew also experienced explosive growth, intensifying from a Tropical Storm (70 mph winds) on Thursday to a Category 5 Hurricane (160 mph) early Saturday morning - within just 36 hours. 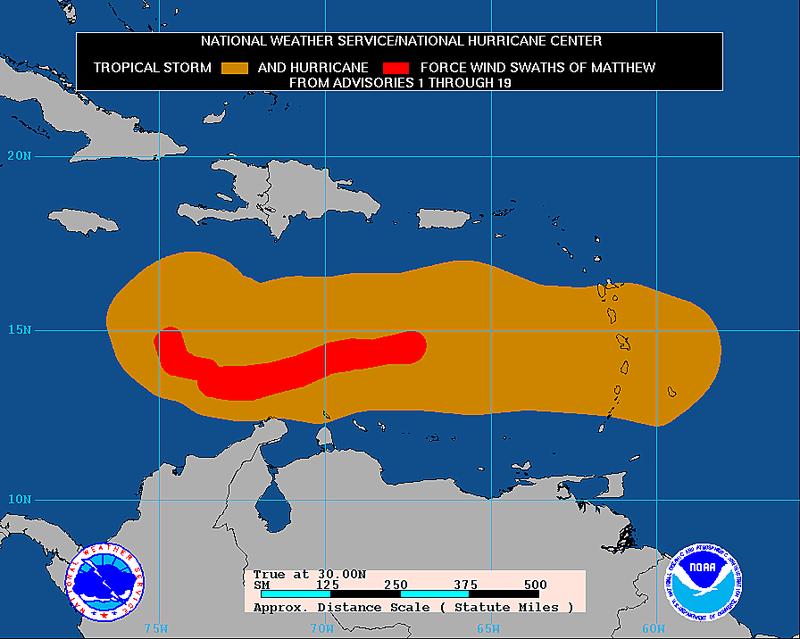 --Its strength alone puts Matthew in a special class - one of only 31 storms to reach Category 5 status in the Atlantic basin since records began in 1851. Forecast models have done an outstanding job predicting Matthew's "sharp right turn," which will pivot the storm's forward motion from westerly to northerly by Monday morning. (Note the current storm motion is toward the Northwest at 5 mph.) Matthew is still a powerful category 4 hurricane, with maximum sustained winds of 145 mph. With the weekend (and several more model runs) under our belt, confidence is slowly rising about what sky and surf issues Matthew's may pose to the U.S. East Coast. However, it is still too early make a definitive "hit or miss" call for New Jersey. It does seem clear that the timing of any potential storm impacts here in New Jersey would be next weekend, Saturday to Sunday. Over the weekend, most model runs push Matthew to the northeast (out to sea) after passing the Carolina coast. Most of the members of this particular plot follow that trend. Such an "out to sea" track would absolutely be New Jersey's best case scenario - we would likely still endure some rough surf and storm surge problems along the Jersey Shore, but would be spared the worst of the hurricane-force winds and tropical rains. While this is not a "zero confidence" forecast as I noted last week, it's still a "low confidence" forecast. There are four aspects of Matthew's forecast that are likely going to "wiggle" as the storm charges northward. Any little change in the short-term can lead to big changes in the long-term outlook. --Longitude/Track??? As I already discussed, the further west the center of Matthew tracks (closer to the coast), the worse the weather impacts for New Jersey. Even if the storm steers out to sea, the Jersey Shore may still get smacked by significant surf and surge. --Speed??? The faster the storm's forward motion, the sooner it hits and the sooner it leaves. The slower it goes, the later it hits and the more prolonged the effects. --Intensity??? Matthew is already a potent "major hurricane". If it maintains its strength (or becomes even stronger), the more severe the potential impacts. --Size??? This variable is especially important for the "out-to-sea" track. In a bigger (and stronger) storm, the tropical storm force winds will extend further out from the center. Thus, the chance increases that damaging winds will impact us. So yes, multiple question marks remain, which will hopefully be resolved soon. Whether you live along the coast, or far inland... Whether you have outdoor plans next weekend, or not... Whether you believe meteorologists are professional scientists with your best interest in mind, or crackpots receiving bribes by every grocery and improvement store in the state... It is going to be exceptionally important to watch the forecast very carefully this week, especially over the next 48 to 72 hours. Our next comprehensive forecast update will be posted here by 7 a.m. Monday.